Our first shirt in from the new tour pictures the 2007-model E Street Band on the front, a group photo in a distressed-style ink. 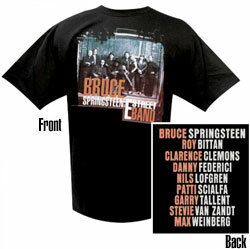 The back features the names of the band members: Bruce Springsteen, Roy Bittan, Clarence Clemons, Danny Federici, Nils Lofgren, Patti Scialfa, Garry Tallent, Stevie Van Zandt, and Max Weinberg. Black, 100%pre-shrunk cotton.